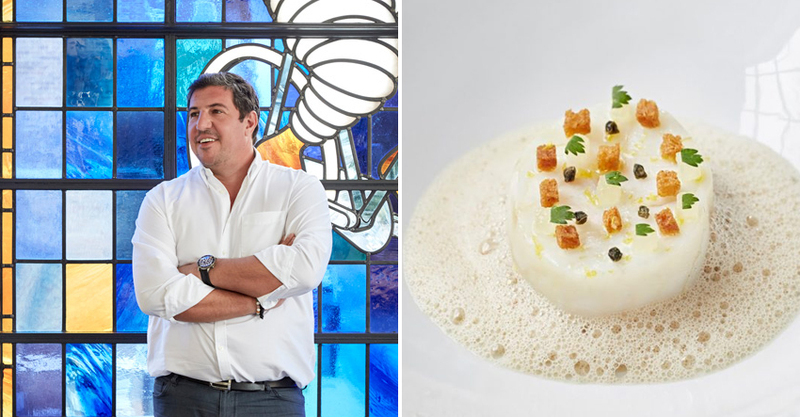 With a Michelin star at the young age of 26, the position of head chef at the legendary Bibendum, London, and being called a phenomenon in the culinary world—Claude Bosi needs no further introduction. Fascinated by the tandoori skills of India, the chef is in Delhi to present his own skills and dishes from his restaurant featuring new-age French food, during a special pop-up at the newly-launched Upstairs at the Indian Accent. Not new to hosting international chefs, especially after the collaborative menu with celebrated Italian chef Sabrina Gidda last winter, Indian Accent has promising plans for its new premises at the luxurious Lodhi Hotel. Needless to say, one can feel the excitement that Claude Bosi exudes with his cooking in this space.Vogue got an exclusive tête-à-tête with the visiting chef over his curated menu featuring spectacular wine pairing by Daniel Beedle. If there were a vote for the finest sophistication in dining, the majority would go to the French. Bosi mastered this cuisine long before it became trendy in India. “I think people often think of French food as too heavy and rich. I think it if it’s done properly, it’s still one of the best in the world. The great thing about travelling to places like India for me, is the merging of the traditional elements of French food with flavours and techniques that are new. I think that is what I would like first-time diners to think of when they think about my food. I’m still a French cook who enjoys learning and using new ingredients,” adds Bosi over a plate of Kanyakumari Crab, served with a succulent apple and nimbu lemon crust that oozes with unexpected flavours and is paired with a delicious Marlborough Sauvignon Blanc. Personally plating each and every plate that passes the mis-en-place, one instantly knows that the two Michelin stars on Claude Bosi’s mantle haven’t come easy. He does have tips for all those aspirants out there (and reading this) for their own Michelin stars, “I would say be honest with what you can do. Be true to what you believe; what you want to cook. It’s very easy to follow trends but be consistent, understand your customers and why they come to you, and you will have a strong business. And maybe the Michelin star will follow.” Amen to that from the Instagram generation, a social media platform Bosi acknowledges as important for the culinary world. Does it affect the way he sees his dishes? “Yes, it does, though the main absolute focus for me is the flavour. However good a picture might look on Instagram, it has to have the flavour of the ingredients, and taste good!” And on this note comes a stunning Pepper Parfait, assembled in an orb, perched on pineapple and surrounded by edible flowers—a dish that will soon be seen peppered on Indian Accent’s geotag on Instagram.